Brazil may be on opposite seasons for those of us in the Northern hemisphere, but there’s a lot to love in this issue, and importantly, lots of separates that can be layered and thus worn nearly all year round! Let’s take a look at my highlights, shall we? First up is a group of Plus-sized patterns, all made up in white. The dress and shorts are alright, and the trousers have some interesting pleated godets at the hems, but ooh, look! It’s that jacket I loved from the first November issue (seen here on the right), but graded up to size 48! The designer style this month is Emanuel Ungaro, and when I first looked at these two, I thought the one on the left was a skirt pattern, and the one on the right was a dress, but they’re actually the other way around! 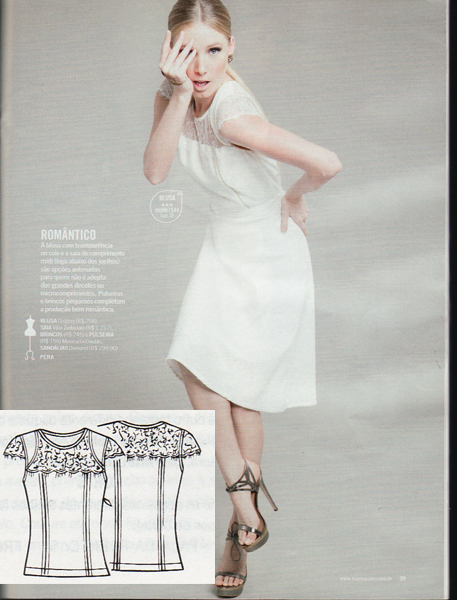 In the white-style feature, I love this little blouse with delicate lace in the yoke and shoulders. Quality lace can be really expensive, but this is a great way to showcase it without needing to buy too much yardage. Manequim and I are totally seeing eye-to-eye on the split-seam shorts – I swear this is about the fourth pattern they’ve done this year for them in varying styles! I must make some soon, even if it’s to wear next to the radiator. This tie-neck blouse is actually really cleverly cut – rather than an added-on neck band, the ties are actually extensions of the front pattern pieces. This pattern’s offered in a few different sizes, and I think it’d look great under a jacket or cardigan for officewear, too. I don’t like the patchwork fabrics they used on this dress, but I really like the tech drawing – it reminds me a lot of Rachel’s free Brasilia dress pdf pattern, too! Finally, in a feature about bright colours, I really like the design of this double-layered, lapel-less jacket, and also the trousers they’ve paired with it. I’ve seen these pockets somewhere else recently, too, and the belt loops would be an easy feature to add onto your own favourite jeans pattern, too. Australians and other Southern hemisphere dwellers – which of these speak to you right now? FehrTrade patterns – now in size XXS!